As predicted yesterday, the amount of capital the banks need is far in excess of the amounts they were negotiating. This news just in from the NYT confirms what had to be the case. If we do the math based on project bad debts, it had to be in the $20bn + range for the big banks. Similar results will apply to Wells, Citi, PNC and others in the group of 19. Watch out for the stock market tomorrow. Reality bites. Where are the bank visionaries when we need them? As we watch for bank stress test results in the US and other countries efforts to deal with Banks’ asset valuation and capital levels, its useful to keep a track on the economic back drop, and assess the bank’s efforts to address their real problem, which is over-valued assets. The US stress tests specifically address the impact on banks under certain sets of future assumptions for economic growth and stability. The Commission forecasts a sharp contraction of the EU economy by 4% in 2009 (relative to a positive growth of 0.8% in 2008). Almost all EU countries are severely hit by the worsening of the financial crisis, the sharp global downturn and ongoing housing market corrections in some economies. However, with the impact of fiscal and monetary stimulus measures kicking in, growth is expected to regain some momentum in the course of 2010 (annual growth forecast for 2010 stands at -0.1%). Figures are essentially the same for the euro area as for the EU as a whole. 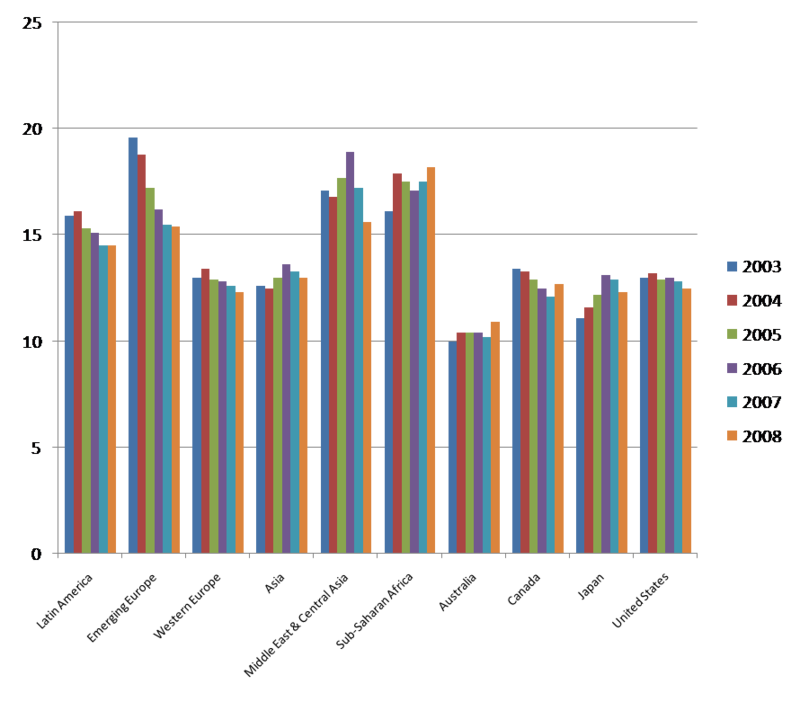 These figures represent a significant downward revision compared to the autumn forecast and the interim forecast of January 2009. So far the news is not good. 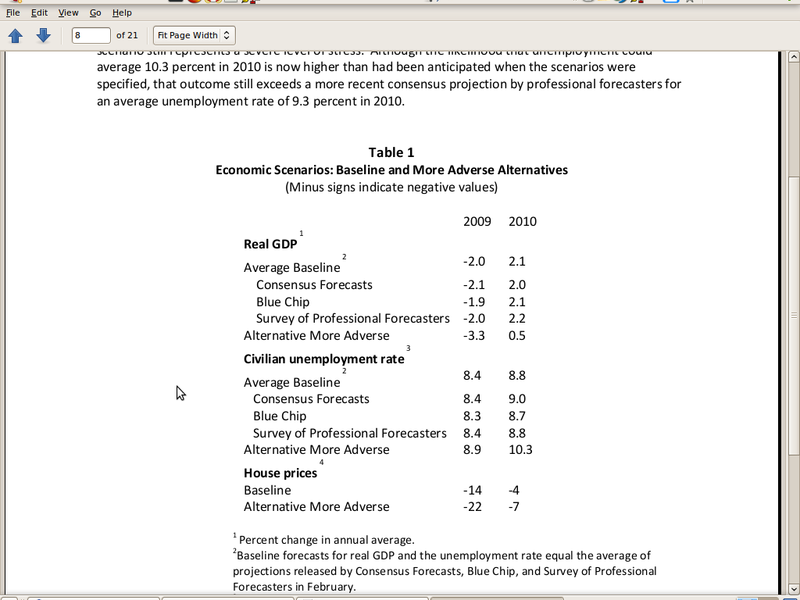 We have US, Japan, and now EU all noting significant downward adjustments to their forecast for 2009. Magically, they all seem to agree 2010 will be just fine. 2010 aside, the consensus for the big three are 2009 GDP drops in the 4 % – 6+ % range. Here is an extract of the baseline forecasts used by the Stress tests, contained in their methodology document for SCAP (Supervisory Capital Assessment Progam). The short view is that the assumptions for GDP growth in 2009 are approximately 1/3 of the latest forecasts. Put another way 2009 is going to be 3 times worse than the forecast used in SCAP. This is only May, so one can only assume that on a probability scale the opportunity for additional downward revisions are as possible as any other prediction at this stage. The debate amongst BofA, Citi and the government on whether they ought to raise $5Bn in capital is ridiculous, and counterproductive. As the economic forecasts show, the amounts required are not going to be debated in the $1 Bn range – this needs vision that produces 10’s or 100’s of billion in improvement such that the organisation can leap ahead of the economic crisis and look out 10 years, not 1 month, which seems to me to be the current landscape for banks. Incidentally, to place $5Bn in perspective, Merrill Lynch paid out $3.6 bn in bonuses at the end of 2008. Geithner should not even take a phone call from any bank who wishes to discuss anything thats less than $20 bn. A debate over $5bn is ludicrous. All this to say, that banks are stuck in a classic rat hole and surrounded. Which bank and which leader will step up with vision for the future that carries banks on beyond 2011? Banks need to take a leaf out of Sergio Marchionne, Fiat chief executive’s book. He is in Germany this morning proposing a deal that will take advantage of the current climate, and look to take advantage of infrastructure provided by Vauxhall, Chrysler, Opel and Fiat to structure an effective platform around car types that consumers actually want and need, ie smaller, cheaper and more efficient. Already he is getting positive reaction to his plan, and these meetings only took place today (Monday). He hopes to complete the transaction by the end of May, and list shares of the new company, tentatively called Fiat/Opel, by the end of the summer. Mr Marchionne said Fiat and Opel would reap synergies of €1bn a year by merging their small B and midsize C segment car platforms, and absorbing Fiat’s ultra-small A platform and Opel’s upper-middle D platform. Note the timing – he is going to do this in one month. This new conglomorate will involve hard decisions and layoffs. This is the hard reality of the adjustment required for the new economy. Getting through the crisis is not a return to 2007. It is a fundamental shift to a smaller and different economy. Where are the bank visionaries now? Are they becoming so bogged down worrying about beaurocratic discussions with their new government masters and defending bonuses and perks that they have lost sight of the real goal? This is turning into something of a joke. The whole point of the ‘stress tests’ was to objectively assess the capital requirements of the Banks’. Surely no-one could have imagined any outcome other than a requirement to raise more capital. The only debate might be amount and over what period. In any event there can be no reason to delay the production of the results. The market is living in the false belief that the government will not hold the banks feet to the fire, at least judging by the stock market. If we do not get this over with, and get the facts out, the Governments’ hands will be tied even more to full nationalisation as the only way to avoid another market crash. Citi, one of the biggest victims of the crisis that has already been bailed out three times by the government, is believed to have been told by regulators that it needs more than $5bn in fresh capital, while BofA might need to convert $45bn in government preferred shares into common equity. This is a very sensible article by Neil Hume at the FT. He notes the extraordinary growth in bank stock prices since the infamous CitiBank memo in March, wherein he basically pronounced the worst as over, because he had removed the bad people, was instituting new processes, and working with Government. Add it all up, and the reason banks have rallied is investors are no longer worried about nationalisation and are prepared to look through two years of rising bad debts and impairment charges to a recovery. “There is increased appetite from the market to accept 2009 and perhaps 2010 as lost years from a bank profit perspective and buy stocks for post-recession earnings,” says Jason Napier of Deutsche Bank. Hmmm… all I can say is I don’t think so. Since when is the market willing to wait beyond 1 quarter, let alone 2 years? Such thinking is precisely the kind of thing that pressed the exuberance of the last few years before this crisis – the ability to rationalise perverse events with thinking that sustains the perverse events. more economic events – just this week it has become clear that the projections on the economies of all advanced economies were overstated by orders of magnitude. In my view, the impact of deleveraging has not yet hit the Banks’ of North America or UK. Their capital bases are razor thin, with extraordinary levels of debt to equity. Just one event can wipe that out. It is painfully strange that the US Fed as again yesterday deferred the announements on the stress tests of the 19 banks’, 19 banks’ who as far as I can determine have yet to be named. If the news was good one might assume the announcements would have come back in March? The jury remains out. And the detail contained in the 247 pages is work that is substantially net new since January this year. I say this in defence of Geithner, and his quiet approach at first. He has been rather busy. But to the report to Congress today. The report sigtarp-april2009_quarterly_report_to_congress: SIGTARP site. Summary of Geithners testimony at FT. He descirbes the Stress test results as mixed. A quick review of the report tells me that the answer is not captured in a sentence, so have to dig further to find out what mixed means. Tim Geithner acknowledged that evidence of improved liquidity as a result of the bank bail-out was “mixed”, but defended the $700bn troubled assets relief programme against charges that it gave an easy ride to the financial sector. Appearing before a Congressional oversight panel on Tuesday, the Treasury secretary said interbank lending, corporate issuance and credit spreads showed signs of a thaw in credit. “To date, frankly, the evidence is mixed,” he said. The IMF report had a spreadsheet in the appendix with bank capital levels around the world. While it has individual countries, I summarised into this chart. The data shows Capital as a percentage of Assets so higher is good, lower is bad. Note the negative trends in most except Canada, and this is based on the latest data to end of 2008. Use the thumbnail for a larger version that is clearer.